Herbalife in particular has been accused of targeting and exploiting the Latino community. Herbalife's records indicate that at least 60 percent of the company's distributors are Spanish-speaking Hispanics, and the total number of Hispanics might be as high as 80 percent when bilingual and English speakers are included. Harris never gave a reason for declining the request. 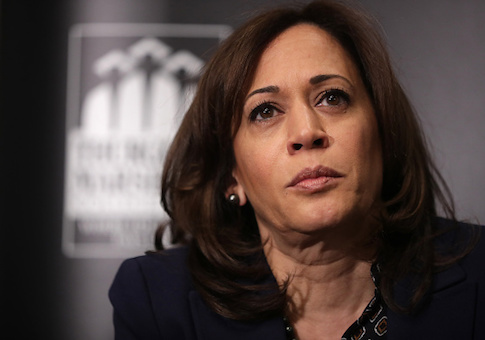 But Yahoo News notes that around the same time Harris received the first of three donations from Heather Podesta, whose ex-husband Tony Podesta runs a powerful lobbying firm that represented Herbalife at the time. Heather Podesta, a high-powered Washington lobbyist in her own right, was hired by Herbalife herself a year later. Herbalife was also represented by Veneble LLC, a prominent law firm that employed Harris's husband, Douglas Emhoff. "It’s disgusting," Latino anti-Herbalife activist Julie Contreras told Yahoo News, adding that "Kamala Harris did a huge injustice." Contreras supports Beto O'Rourke in the presidential race instead, and her punny Spanish nickname for Harris is "Qué Mala," meaning "how bad." Brent Wilkes, head of LULAC when the group urged Harris to take action, was more reserved but also critical. "I wouldn’t limit my disappointment to her. At least Kamala listened," he said. Illinois' attorney general Lisa Madigan managed to win a $3 million settlement from Herbalife around the same time. "Kamala should have had that too," Wilkes said, with Yahoo News noting his "audible disappointment." The Harris campaign pushed back, saying she "has a long record of going after bad corporate actors engaging in fraudulent behavior and delivering results for people who have been taken advantage of." This entry was posted in Politics and tagged Kamala Harris, Yahoo. Bookmark the permalink.